Relatively little XPS analysis of Sc and its oxides has been completed beyond the reporting of BE values taken of the metal and pure oxide (Sc2O3) [1,2]. This is presumably due to its relative rarity and low level of industrial use. The XPS data from Sc metal and its oxide, Sc2O3, which has no unpaired electrons, can be simply fitted with a doublet of appropriately constrained peaks. 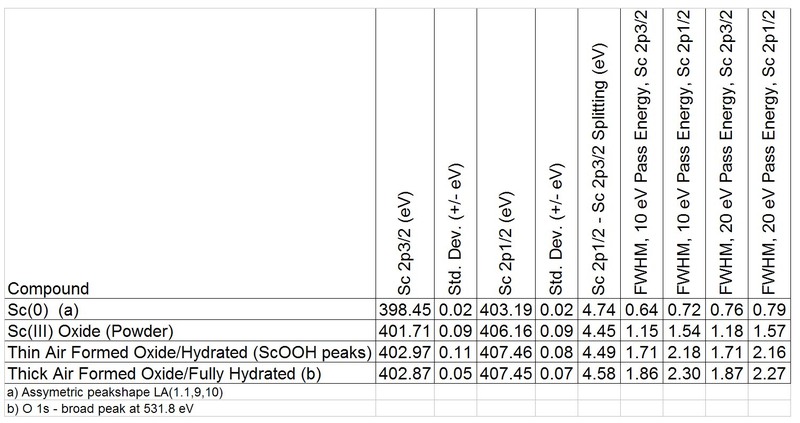 Peak fitting parameters for Sc 2p spectra are presented in Table 1 . The Sc 2p1/2 peak for each species is constrained to be at a fixed energy increment above the Sc 2p3/2 peak. The intensity ratio of the Sc 2p3/2 and Sc 2p1/2 peaks is constrained to 2:1. This is consistent with the expected ratio of (2j1+1)/(2j2+1), where j1 and j2 represent the coupled orbital (l) and spin (s) angular momentum quantum numbers from respective spin-up and spin-down states of the unpaired core electron subsequent to photoionization. 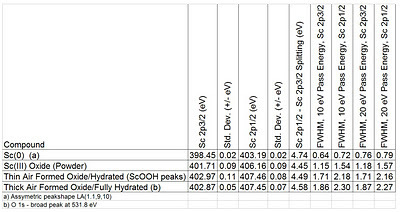 The Sc 2p3/2 XPS BE peak for the metal is at 398.45 eV and is fitted with an asymmetric peak-shape (Figure 1) . Table 1. Spectral fitting parameters for Sc 2p species: binding energy (eV), FWHM value (eV) for each pass energy, and spectral component separation (eV) . Figure 1. Sc 2p spectrum (top) of a thin, air formed oxide (10 minutes laboratory air) formed on polished Sc metal using peak fittings derived from Table 1. The Sc 2p spectra for Sc2O3 (middle) and Sc metal (bottom). The Sc 2p3/2 BE for the pure oxide standard is at 401.7 eV (Figure 1) with a main O 1s peak at 529.7 eV (FWHM ≈ 1 eV) indicative of a lattice oxide. This is in good agreement with literature values . There is also a second O 1s peak at approximately 1.6 eV above the main peak (≈ 2.0 eV FWHM) that constitutes 25-30% of the total O 1s envelope. This peak may be ascribed to defective sites in the oxide or to hydroxide functionality (probably a mix of both). A small amount of organic oxygen, normally C-O-C, will also be present in the adventitious hydrocarbon overlayer . In contrast, the thick air-formed oxide (formed over a period of years) has a Sc 2p3/2 BE of 402.9 eV and a broader O 1s (FWHM ≈ 2.6 eV) peak at 531.8 eV indicative of hydroxide and hydrated species. A thin, air-formed oxide (10 min laboratory air), on polished Sc metal (Figure 1), was collected without the aid of charge neutralization and has been described as an insoluble hydrous oxide (ScO(OH)) . The intermediate structure between the metal and ScO(OH) peak can be explained by the oxide (doublet of peaks set at 3.16 eV above the metal doublet), and by the formation of a thin sub-oxide layer at the oxide/metal interface. From the fitting of the O 1s spectrum, an approximately 1.3:1 oxide to hydroxide ratio is obtained which incorporates a combination of the oxy-hydroxide, oxide and sub-oxide species. A small amount of adsorbed water was also detected . J.F. Moulder, W.F. Stickle, P.E. Sobol, K.D. Bomben, Handbook of X-ray Photoelectron Spectroscopy, Perkin-Elmer Corp., Eden Prairie, MN, 1992. M.C. Biesinger, L.W.M. Lau, A.R. Gerson, R.St.C. Applied Surface Science, 257 (2010) 887-898. A.G. Sharpe, Inorganic Chemistry, Longman Scientific & Technical, New York (1988) 574.